A great many modern performance cars rely on active aerodynamics to reach an optimal combination of drag coefficient and downforce, and it looks like the Chevrolet Corvette could soon offer new forms of active aero technology. 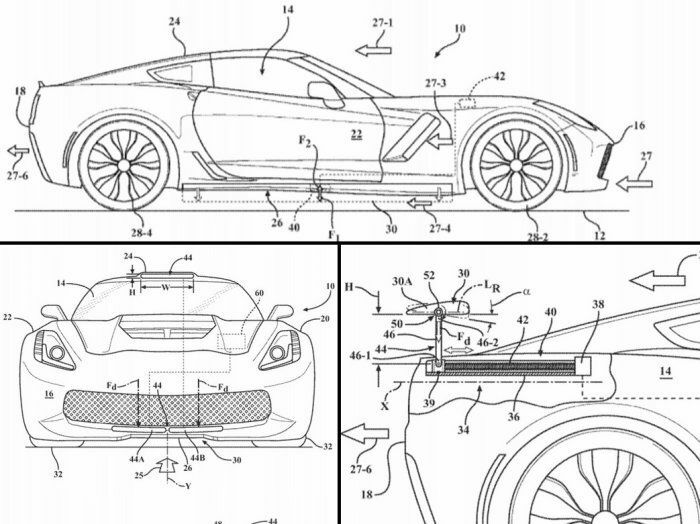 General Motors has filed for three new patents with the United States Patent and Trademark Office, and each of these items is display in the patent drawings on a C7 Corvette. While it seems unlikely that the Corvette would get new technology like this so late in the life cycle of the C7 generation, the company could be using the current Chevy sports car to develop and protect these new features while planning to integrate them into the next generation Corvette. First up, shown in the largest portion of the image above is the new active side skirt design. This lower portion of the body will be able to extend further towards the ground to control the turbulence in the wheelbase at high speeds. This system would be particularly beneficial for a track mode, as having the side skirts hang too far down would be a problem in many street driving situations, but on the track, the skirts could provide the greatest aerodynamic impact without any concern of bottoming out over a manhole cover or some other real world issue that doesn’t occur on a race track. Next, General Motors is working on a system of downforce generation ducts that will be located in the front fascia and on the roof of the Corvette. Downforce ducts are common in the racing world and roof ducts are a popular feature in the world of rally racing. On the Corvette, these ducts could be used to apply downforce in key areas that would be dependent on vehicle speed, and integration would be fairly simple. In the bottom-left portion of the image above, you will see the active rear spoiler on a C7 Chevrolet Corvette. Like most active rear spoilers, this unit will be able to adjust the angle of the spoiler and the height, but it will also be able to move laterally along the back of the car. In other words, the new wing will be able to move closer to the rear glass or further out over the rear end depending on the speed of the vehicle. We have put together the picture above with a quick look at each of the three key areas of reference, but you can check out tons more images from the filing over at CorvetteBlogger.